The Born This Way singer recently shocked audiences after performing in Sydney's Town Hall dressed in a black shroud and mermaid costume while sitting in a wheelchair. 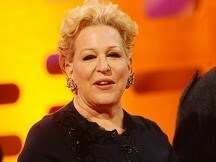 But 65-year-old Beaches star Bette write on Twitter the routine belongs to her and demanded Gaga left it alone. Bette tweeted: "I'm not sure Lady Gaga knows that I've performed my mermaid in a wheelchair for millions of people - and many of them are still alive..."
She then appealed directly to Lady Gaga writing: "Dear Lady Gaga if you think a mermaid in a wheelchair seems familiar-it's because it is!You can see it on youtube 24/7-with ME performing it. "Dear Lady Gaga I've been doing singing mermaid in a wheelchair since 1980-You can keep the meat dress and the firecracker t**s-mermaid's mine." But Bette, whose HBO show Showgirl has just been nominated for an Emmy Award, later offered Gaga an olive branch, and hopes to meet up with her at the Emmy ceremony. She tweeted: "Lady Gaga, let's drink this over at the Emmys in September. Fabulous mermaids can coexist!"